Very cool to name the AL & NL batting champs after Rod Carew and Tony Gwynn. Even better to do it at the San Diego All Star Game. Am I the only one who thought Collins was sitting Michael Conforto because the American League started a left-handed starter in Chris Sale? The Terry Collins getting tired of the Royals’ hitters jokes after the Eric Hosmer and Salvador Perez homers were about as funny as Sophie’s Choice and as original as Carlos Mencia’s standup. I still can’t believe Collins let Jose Fernandez pitch to David Ortiz after Fernandez said he was going to groove one in to Ortiz in a game with World Series homefield advantage on the line. Fortunately, he didn’t, and Ortiz walked. Speaking of Ortiz, just go away already. I double down on those feelings after seeing how Tim Duncan retired today. love how Terry Collins lifted all the Cubs starters – Anthony Rizzo, Ben Zobrist, Kris Bryant, and Addison Russell – as the game got close and late. You don’t want the Cubs playing with the World Series on the line. By the way, remember when the Mets announced to everyone they were signing Zobrist – even after he already agreed to a deal with the Cubs? 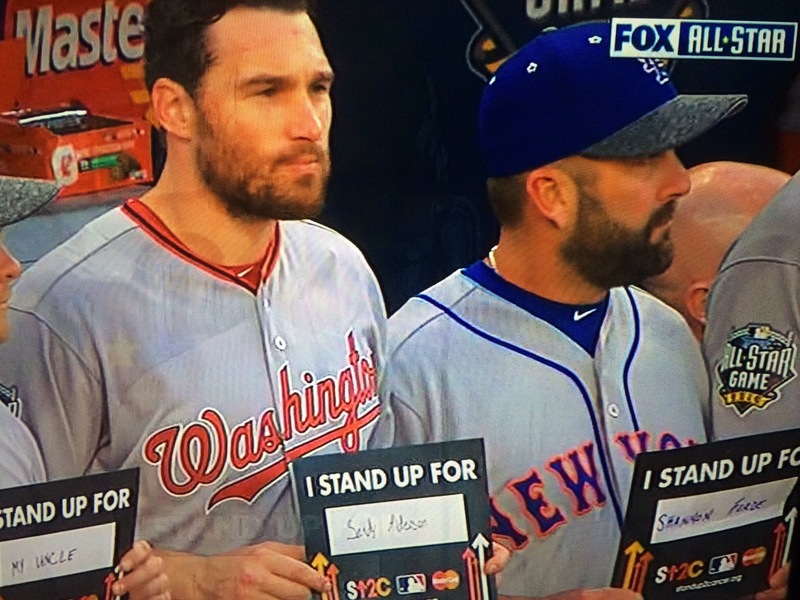 As I learned during Game 3 of the World Series, the home team tapes the Stand Up to Cancer signs to each seat with a generic statement like “Survivors.” During the World Series, you could fill-out your own in the Jackie Robinson Rotunda. I was shocked there weren’t any “Tony Gwynn” signs in San Diego. Speaking of Murphy, that Net Negative saved a run with a nice defensive play that Neil Walker doesn’t make. Just saying. It should be noted Murphy reached base in all three at bats, including being the first ever batter to be awarded first base after a replay in the All Star Game, as he’s clutch in the biggest moments. It was fun being able to root for Murphy again. It was also great seeing Carlos Beltran appear in the game in what is likely to be the last one for the future Hall of Famer. He joined David Cone as the only players to appear for the Mets and Yankees in an All Star Game. Note, remember this on Friday. Seeing the Jacob deGrom GEICO commercial reminded me of how great deGrom was in last year’s All Star Game. I was shocked Mark Melancon wasn’t wearing his Mets hat when Collins brought him into the game in the seventh. Nice to hear the blurb about how Terry Collins wanted to get at least one representative from each team in the game and then not pitch Jeurys Familia or Bartolo Colon. Apparently, he thought Mets fans were content seeing just him. But hey, at least the fans of the other 14 teams were upset with him. And that’s the thing, in essence, I tuned in to watch Terry Collins manage and try to figure out again why the Mets didn’t re-sign Daniel Murphy. In the process, the National League lost the game and homefield advantage in the World Series in a game that saw them leave 10 runners on base. In that sense, the game wasn’t too dissimilar than watching a Mets game.